Cars aren't just about the daily commute. Many Americans count on their vehicles for outdoor pursuits, which is one reason why SUVs and crossovers have become so popular. But there are some critical differences between their handling, hauling and off-road capabilities. To help you decide on the right adventure-mobile, we've selected two representative models and trims. For the SUVs, it's the 2019 Toyota 4Runner. 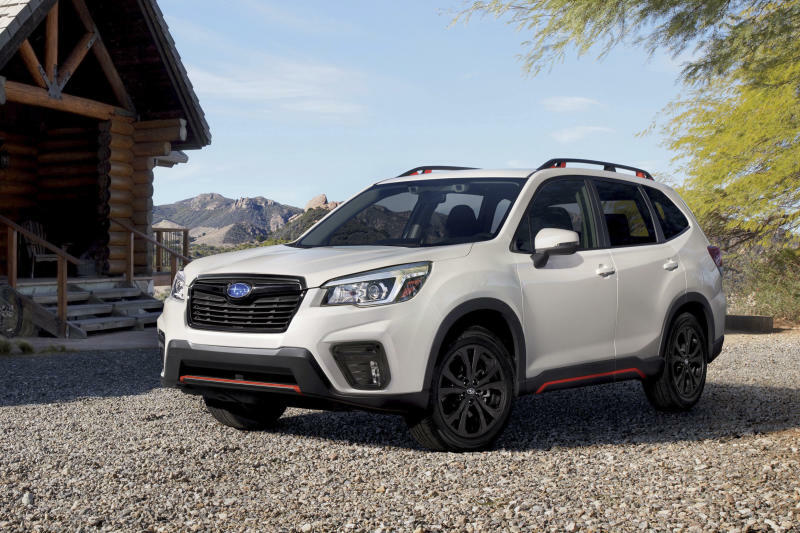 Our crossover candidate is the 2019 Subaru Forester. The Subaru Forester, which comes standard with all-wheel drive, starts at about $25,000. But for this comparison, we're using the top-of-the-line Touring trim, which checks in at around $35,000. The base Toyota 4Runner SR5 trim level stickers at about $38,000, with optional four-wheel drive added. The trim we're using for this comparison, the Toyota 4Runner TRD Off-Road, pushes that price to about $39,000. OK, so the 4Runner is more expensive. But that's partly justified by what you get: It's bigger and more powerful and it has a little more ground clearance. Its V6 engine produces 270 horsepower and can tow up to 5,000 pounds. The Forester's four-cylinder engine makes just 182 horsepower, but it does an adequate job of getting it up to speed. It can only tow 1,500 pounds, but it's quiet and smooth. You'll notice a big difference at the pump. The EPA fuel economy difference between the two is staggering: 29 mpg combined for the Forester versus 18 mpg combined for the 4Runner. Both the 4Runner and the Forester have excellent cargo space. Skip the 4Runner's optional third-row seat and you get up to 47.2 cubic feet of cargo space behind the second-row seats versus 33 cubic feet in the Subaru. Here's where SUV versus crossover really comes into play. The 4Runner's body-on-frame construction is based on old-school truck design. By separating the frame from the body, the loads involved in towing, off-roading and overall heavy-duty work stay with the frame. But the downsides are that the 4Runner is heavier, less space-efficient, and doesn't ride or handle as well as a vehicle with unibody construction. That's what the Forester has. The Forester is a little smaller on the inside, but it's a lot smaller on the outside: about 10 inches shorter and 3 inches lower. That means the Forester is easier to park and maneuver. It also sits lower to the ground, facilitating entering and exiting. But Subaru still gives you plenty of ground clearance: 8.7 inches compared to the 4Runner's 9.6. At our price range, the 4Runner's interior is dark and drab. It suffers from chunky buttons and large knobs. Most controls are easy to use, but Toyota's infotainment system has one USB connection — for music streaming only. To unlock its full capabilities, you have to download a separate app on your smartphone. Finally, the 4Runner has just one 12-volt power outlet. The Forester, meanwhile, is brimming with modern conveniences. It features Apple CarPlay and Android Auto, and although it also has its own proprietary app, you can use many infotainment system features without it. This Forester trim also has four USB ports for charging and data. Unlike the 4Runner, the Forester does offer seat heating and ventilation in this price range. Rear passengers also get more legroom and their own seat heaters and power ports to keep their devices charged. The Subaru, with its EyeSight camera-based system, provides adaptive cruise control, active lane guidance, blind-spot detection and forward collision mitigation. The 4Runner has none of these things. When optioned with its four-wheel-drive system, the 4Runner is the off-road victor. Its traction management system maximizes the grip to all four wheels so you can conquer rocky climbs. The standard low-range transfer case gives you a boost of torque for steep ascents and rock-crawling capability. The TRD Off-Road version also comes with Multi-Terrain Select, which turns the SUV into a nearly unstoppable climbing machine. This vehicle is for those who want to get dirty. The Forester's standard all-wheel drive is also capable even when the road gets rough. Its software controls do an admirable job of keeping it moving forward; it can limit wheelspin on individual wheels so you're not stuck because of slick or loose surfaces. However, the Forester doesn't have the same degree of suspension articulation and front- and rear-overhang clearance as the 4Runner. It simply can't handle the larger drop-offs and rocks that the Toyota can gobble up. EDMUNDS SAYS: The Forester and the 4Runner are both excellent lifestyle vehicles. The 4Runner is ideal if you tow or demand the ultimate in off-road capability. But for most people, the Forester's price, fuel efficiency, superior handling and better in-cabin experience will win the day.